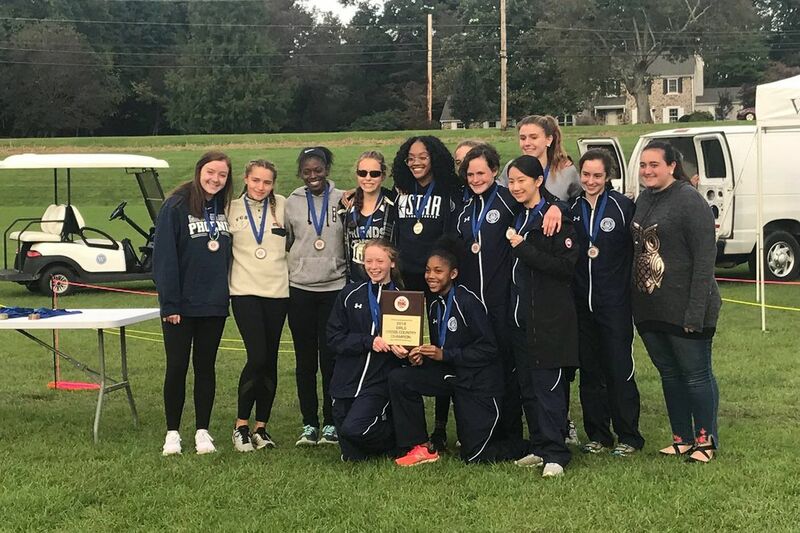 The Friends' Central girls' cross country team came in first place Tuesday to win the Friends School League Championships at Westtown for the fourth straight year with 33 points, edging Germantown Friends by a point. Rebecca Wusinich, from Friends' Central, came in first place at 18 minutes, 32 seconds. Teammate Micah Trusty clocked in at 18:49.48 for second place. Germantown Friends' top finisher, Annika Marcelis, came in third place at 19:03.48. Germantown Friends won the Friends School League Championships with a score of 29. Miles Gomez-Younkin finished second overall in 16:51.15. Ben Rosin, also of Germantown Friends, came in third place at 16:51.53. George School's Jeffrey Love won the event at 16:21.42. Karla Diaz scored all five goals for the Lincoln as she carried the Railsplitters to a 5-2 victory over Hill Freedman World Academy. Lincoln improves to 12-1 in the Public League American Division, and will play Southern Wednesday to determine the regular season champion. Kaila Rahn and Sara Shipon each scored as Penn Charter edged Episcopal Academy, 2-1. Mo'ne Davis and Loui McIntyre each recorded a goal in the second half to lift Springside Chestnut Hill over Germantown Academy, 2-0. Nazareth Academy erupted for three goals in the second half thanks to Katie Harmon, Kirstyn Kinniry, and Steph Marino in a 3-2 triumph over Mount. St. Joseph. Margaret Harvey's first goal of the season was a game-winner in overtime as Germantown Friends beat Moorestown Friends, 1-0. Ella Davidyock scored the game's only goal in the second half in the George School's 1-0 win over Shipley. Lauren Irvine and Mabel Moosbrugger each netted a goal as Central blanked Franklin Towne Charter, 2-0. Sidiki Fofana scored the winning goal in the second overtime as Archbishop Ryan sneaked past Devon Prep, 2-1. Dylan Devlin added a goal for the Raiders, who will play Roman Catholic Friday in the PCL quarterfinals. Philip Burckhardt delivered the game-winning goal in overtime to lead Springside Chestnut Hill over Malvern Prep, 2-1. Luke Greenberg contributed a goal for the Blue Devils. Springside Chestnut Hills gathers together after beating Malvern Prep in overtime. Nkosi Graham tallied a hat trick for Holy Ghost Prep in a 3-1 victory over New Hope-Solebury. Ryan Kaliner scored the game-winning goal in the second overtime to lead Shipley past Moorestown, 1-0. Dean Manor and Josh Galia combined for seven saves for the Gators. Penn Charter defeated Germantown Academy, 3-0, behind goals from Jude Shorr-Parks, Billy Melnick, and Niko Krueger. Jason Stearn assisted two goals while Kyle Earley earned the shutout in net. Jackson Birtwistle led Radnor with a pair of goals in a 3-1 victory over Upper Darby. David Azzarano chipped in a goal for the Raiders. Harrison Bloch and Wyatt Joseph registered a goal apiece as Lower Merion upended Haverford, 2-1. Mohammed Imon and Brian Salazar each collected two goals as Engineering and Science downed String Theory, 7-1. Rose McCafferty, Taylor Spoerl, and Cady Westkaemper had goals as Jenkintown topped Plumstead Christian, 3-1. Natalie Kolb chipped in two assists for the Drakes. Kate Strickland recorded a goal and an assist as Dock Mennonite beat Delco Christian, 2-0. Elle Bergey contributed a goal for the Pioneers. Danielle Hamm posted a hat trick to lift Perkiomen Valley past Upper Perkiomen, 3-2. Central defeated Masterman, 4-1, to win its fifth straight Public League title. Lancers' Maddie Mast defeated Dragons' Melodie Liu 6-2, 6-3 in the first singles match. Minh Nguyen and Kate Hamilton also won their singles matches for Central. Central's Annie Yang and Shari Zeng defeated Masterman's Nicole Tang and Connie Zhang 6-4, 7-5 to win the second doubles match. The Lancers will play Cardinal O'Hara Thursday in the District 12 Class 3A final at Lincoln.